Classes start next week and I find myself wondering what my students will be like this year. You never know what kind of dancers you will end up with. Most are great, positive attitudes, respectful, willing and eager to learn. While others are a bit challenging, they test you at times to say the least. I look at these cases as just that, a challenge. 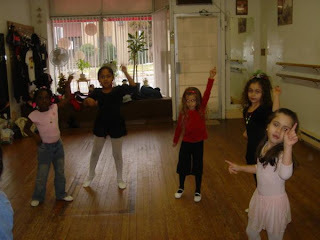 My goal is not only to teach dance class but to turn attitudes around. I know it would be very easy to get frustrated and ignore or dismiss a dancer who just seems as though he/she is not interested in being there with you in class. I however do the opposite and see these student as a project. I choose to take my job a step further and not only consider myself as a dance teacher, but a role model/mentor to my kids. I do a lot of observing and really try to figure my students out. One thing is clear, they have all come to me for one reason... they love dance and want to learn. OK, so we have that in common. Lets discuss those challenging cases. First, those who are unfamiliar with dance class etiquette. No matter what age some students think they are there in the studio to play, socialize, or just get out of their house. Rule 1- The studio is a learning environment. That's where I explain my role as a teacher, to provide leadership and structure to the class. I teach my kids that they should be respectful at all times to myself and their classmates. If we all understand that first and for most we are there to learn, then and only then will there be room for fun. Second, those striving for attention. This is actually a very sad situation, unfortunately i see it a lot, more so with younger students. I witness lack of discipline and disruptive behavior all just to get noticed. I prefer not to go into detail about why i think some young ones act this way. Instead of wondering why or losing patience i choose a different route. I let students know they are all special in my studio and they can express themselves when its their turn to do so. We have fun time for the younger classes which really helps. Such things as freestyle circles and freeze dance. We encourage each other during this time and clap each other on when we are in the circle. It really brings spirits up and makes everyone feel good about themselves. I notice a change in attitude quite quickly and it really brings me joy. In my experience i find negative discipline never works. Explaining why we act a certain way and positive reinforcement is my choice for turning special cases around. Third, lack of confidence. This is something I witness as my students get older and it really brings the energy of the class down. Another challenging attitude I'm ready to turn around. I usually notice bum faces, then as weeks go by they start to become vocal. "That's to hard," "I can't do that," "You make it look so easy Miss Leslea." Some of my responses, "of course it's hard, I'm here to challenge you to be a better dancer," "don't say you can't, say you haven't mastered it yet," "I make it look easy because its my job, I expect you all to be good at your chosen professions when you get older too." The most common is the dreaded CAN'T. Every time I hear it I turn the music off and ask, "what was that I heard?" The class knows whats coming. If the student is unfamiliar they quickly learn, others chime in with me, "I haven't mastered it yet." There is never a CAN'T that slips by in my classroom, NEVER. With teenagers and adults I often get "ugh yeah sure" or "u do that so good" or "u make it look easy." This one really gets me and makes me uncomfortable at times. If i know their profession (the adults) I'll usually become very specific and say for example, "well i bet you make accounting look easy." I just go over the fact that this is my job, I am their teacher and if I didn't do my job well they would not be in my company right now. I'm sure they would find another studio with an instructor who does perform his/her job well. Then I usually get giggles and it diffuses the situation. Fourth, the unmotivated. This is usually a case where the dancer just loses interest or something is bringing them down outside of dance class. I will talk this situation out privately, usually after class in my office. I ask what wrong, you don't seem yourself, are you still enjoying dance class? Sometimes dancers bring their problems to class with them and are just looking for someone to talk to. I offer that ear to them. I also tell them to do their best to leave their troubles in their dance bag, sometimes when you are done with class they are gone. I let them know they can talk to me in confidence. Very rarely someone will confess that they are not enjoying themselves with dance anymore and I let them know that it's OK. To inform their parents and tell the student to maybe take a break, try something new, and that the studio will always welcome them back if they decide to return and i will not be upset with them. Fifth, the competitive attitude. That talented student who knows they are the best in the class. I diffuse this situation by telling the class as a whole that we are a team. With dance there is always something to strive for. Their is no finish line or perfection in dance. If it comes down to it I will talk privately with the student and let them know that this kind of behavior is not welcomed in the classroom and makes me and the other students uncomfortable. I share with them something my mother always told me, "no matter how good you are, there will always be someone out there in the world who is a little better then you." For example, if you can do 10 fouettés image someone that can do 15, and strive for that. That sums up in my experience with some different personality types I find in my classroom year to year. Going in I hope for the best, but like i said before i don't mind a challenge, and I definitely don't mind changing a child's attitude around and being that positive force in their life. I hope this post was useful to new teachers or even experience ones who are looking for a new way to address special cases in their classroom. Summer is coming to an end which means a new school year is right around the corner. With a new school year comes a new season of dance. How can students prepare and make this year their most productive dance season yet? I will be sharing some of my favorite tips that i give to my students during the first month of classes so they can do and be their best throughout the year. Prior to the start of classes- Call your studio and make sure you are ready to go. Have all of your shoes and attire you need for class. Make sure you know the times and location of your classes and put them into your planner. Ask if there is anything else you need or need to know before you begin class. It's great to start the year off organized and prepared. First week back- I see nervous new students as well as comfortable faces. Before we start I remind everyone, both new and returning students, why we are here in class together... for our love of dance and to learn of course. My advice for those nervous new students, breath, relax, and know its normal to feel butterflies when you start something new. Remember why you are there and know that after a few classes you will feel great, you'll get use to your teachers routine, and meet new friends who share your love for dance. For those returning students who may be comfortable with the routine, aware of their surroundings and what their teacher expects of them... set your own goals. For example; this year I will become more flexible, I will get that triple pirouette, my grand jeté will be higher, my attendance will be better, etc. Also it's always nice to make the new students feel comfortable, introduce yourself, welcome them into the group. Second week back- Getting to know my students and observing behavior. The excitement of starting something new is over. This is when I explain my goals for the year for each class. Students, I recommend you pay close attention and possibly even write down what your teacher expects of you this season. I'll talk about a "dance diary" later. I have noticed this is the week where I see some sluggish faces. Students feeling the effects of school and homework plus dance class. They are tired and miss their lazy days of summer. This is the perfect time to have a small nutrition/scheduling talk. Students, I suggest when you get home from school you refuel with a healthy snack and then get as much of your homework done as possible before dance class. You should make sure you are eating properly and drinking lots of water, not soda or energy drinks filled with sugar. I like to go more in depth with my teenage/adult students on how food fuels our bodies and what foods are best for dancers. Remember if you set a schedule and monitor your time you will not have to worry about that term paper you have to write while you are standing at the barr stretching. You should be focused in class on dance and this should be a time when you are not stressed about school. Dance is a great outlet and way to destress, its your time, and who needs to be thinking about the school work you put off and should have done before you got to class. Week three-This is where we really start to get involved and are getting set with our routine. I'll explain the Dance Diary at this time. I think this is a great tool, in my experience it really helps a dancer improve and grow. I still use one myself. I tell my students to jot down their personal goals and the goals I have for them as a class. They can get more in depth if they choose by writing everything we did in class that day and their feeling while in class. For example, "It was great when stuck that balance in arabesque." or "I definitely need to work on that combo across the floor." In week three I also reinforce teamwork and address any negative attitudes I'm witnessing privately. 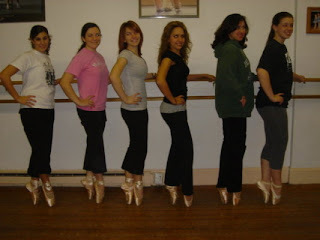 Remember your dance class is like a team, you will have to perform and learn together all year. It is best to have a positive attitude at all times to keep things moving along so you and your classmates can learn, improve, and be your best together. Week four- Really into the groove now. We are comfortable with each other and on a mission. Students, I recommend you stay positive and motivated. Keep your attendance up, use your dance diary, maintain healthy eating habits, balance your time between school work and dance, and practice what you need to work on. When in doubt remember why you joined a dance class, for your love of dance and passion to learn about this beautiful art form. This sums up the first month back to dance and the tips I like to give out. Throughout the year I keep reminding my students of healthy positive habits for a productive dance season. I hope all that read this post find the advice useful. Make this dance season your best ever! I wish you all much success in your journey with dance.